Where seen? 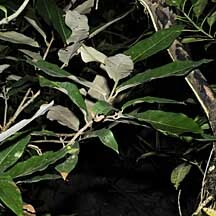 This rather untidy tree with dull metallic leaves is described by Corners as a 'dinghy' tree. It is sometimes seen in our Northern mangroves. Usually found in the back mangroves and sometimes on rocky shores. According to Hsuan Keng, it was found in Bajau, Kranji, Pulau Jahat, Pulau Tekong. It seems intolerant of high salinities and does not occur in very exposed areas or poorly drained soils. Features: A much branched, untidy tree (15-25m tall) with rather 'dirty' looking leaves. 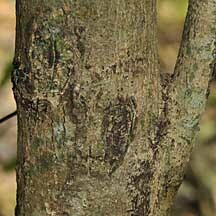 Bark dark or pinkish grey, smooth becoming flaky, fissured when older. May have short plank or sinuous buttresses. Leaves oblong (10-20cm long) thin but stiff, leathery dark green above and silvery white below. This is because of overlapping star-shaped scales on the underside. Leaves are arranged alternately in a spiral and wither to a dull orange-yellow. Flowers tiny (0.5cm) very many loosely clustered in a spray (5-18cm long). 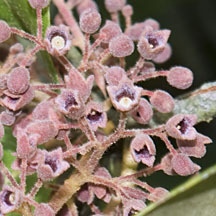 Bell-shaped calyx and stems pinkish and velvety. 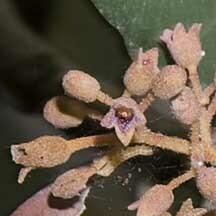 Each tree bears either male or female flowers. 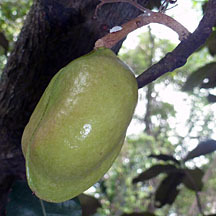 Fruits are egg-shaped (4-5cm) woody with a ridge along the centre of one side so that they resemble boats with a sail. Pale green ripening to glossy brown or purple. The fruits can float for weeks and will germinate when they are stranded at high tide. Each fruit contains one seed (3cm long). The seeds are eaten by large crabs, monkeys and wild boar. Human Uses: According to Burkill, considered "possibly the toughest of Malayan timbers", it is valued for boat building. As masts if the trunk is straight enough, or for rudders and other parts. It is also used in a wide range of household uses. According to Burkill, "the people of Malaysia formerly valued it for stopping bullets. They built stockades of it and raised the thwarts of their pirate canoes with it." Medicinal uses include using the twigs as tooth-brushes, the tanning in them may be good for the gums. Seeds are used in cures for diarrhoea and dysentery. According to Giesen, the heavy wood is good for raw material to be made into wrapping or printing paper. The fruits and seeds are used in treating diarrhoea and dysentery, seeds are used in fish dishes and roots used as fish poison. Status and threats: It is listed as 'Endangered' in the Red List of threatened plants of Singapore. Leaves dark green above, silvery below. Bell-shaped flowers pink and velvety. Thin ridge in the centre. Heritiera littoralis on Total Vascular Flora of Singapore Online: photos and fact sheet. Heritiera littoralis on the NParks Flora and Fauna website: photos and fact sheet. Dungun (Heritiera littoralis) Ng, Peter K. L. & N. Sivasothi, 1999. A Guide to the Mangroves of Singapore I (Plant Diversity). Singapore Science Centre. 168 pp.